Clockwise from left: Art Institute of Chicago; DuSable Museum of African American History; Shedd Aquarium; Museum of Science and Industry. CHICAGO — Some of Chicago's leading cultural attractions are teaming up for an unprecedented "museum week" chock-full of exclusive shows, discounts, and free admission. The week will run Oct. 1-7 and is promoted by Museums in the Park, which represents 11 museums on city parkland as well as the Lincoln Park Zoo. Here's what the museums have planned. Check out Museum Week's website for more information. • Museum of Contemporary Art: $5 off admission if you bring in a receipt from another museum visited during Museum Week. • Museum of Contemporary Art will host MCA Prime Time, featuring live music, performance art and other programs from 7-11 p.m. Oct. 2. • Chicago History Museum will stay open late 5-8 p.m. Oct. 6 to allow visitors to explore exhibitions with staff. • Adler Planetarium will offer an exclusive Museum Week Sky Show at 2:30 p.m. daily. • DuSable Museum of African American History will offer special guided tours of the museum. 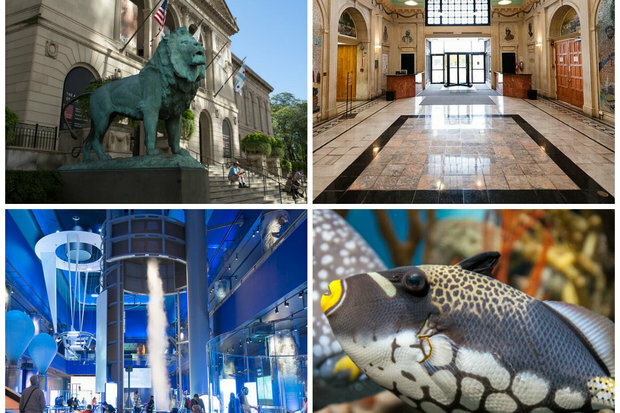 • Chicago History Museum will premiere 30-minute highlight tours of “Chicago: Crossroads of America,” as well as offer excursion tours to Union Station, Old Town, Gold Coast, Lincoln Park and on the CTA Blue and Brown lines. • The National Museum of Puerto Rican Arts & Culture will open the exhibit “Metamorphosis of Divine Entanglements” from Chicago artist Oscar Luis Martinez. • Adler will offer story time with Curious George on Oct. 5. • The Art Institute will open the Artist’s Studio on Oct. 3 and 4 for free family art-making. • Lincoln Park Zoo’s Fall Fest, Oct. 2-4, will include rides, a hay maze, pumpkin patch and educational activities. • The Peggy Notebaert Nature Museum on Oct. 4 will host its Harvest Hop 5K and Harvest Festival, featuring carnival games, autumn treats and a live bluegrass band. Every visitor during Museum Week will enter to win a lifetime membership to the museum. • Shedd Aquarium will have daily animal chats.